Let’s get the obvious criticisms out of the way. First, the whole essay screams first-world problem, something which its concluding paragraph acknowledges. Second, given that, in the Humanities, each year the academy produces five times as many Ph.D.s as there are tenure-track jobs for Ph.D.s, the Chronicle’s decision to publish Professor Blanchard’s lament seems in questionable taste. Think of all the adjuncts seeking a tenure-track position, adjuncts whose work supports the privilege enjoyed by people like Professor Blanchard. There are thousands of highly qualified people who would love to have a tenure-track job — to say nothing of tenure itself. And now, a more substantive critique. The point of an academic position is not tenure. Yes, of course, you should follow the guidelines of your institution, making sure that you do all that is required for tenure. Academics already know this, but to any non-academics reading this: if you don’t get tenure, you’re fired. The university usually employs you for another year, while you look for another job. So, Professor Blanchard was wise to have maintained a focus on that goal. However, the reason for being in academia is to pursue interesting work. So, yes, do keep your eye on the “tenure” prize. But remember, also, that you’re in this for the long haul. Seek scholarly projects that sustain your interest. Volunteer for the service that best fits your disposition (and, conversely, try to avoid service that drives you up a tree). Find ways to keep your courses fresh and exciting: change the syllabus for each one you teach regularly, and invent new courses whenever you get a chance. Getting tenure offers an opportunity to explore newer, perhaps riskier, academic endeavors. Those risks may be intellectual — pushing your own thinking further, undertaking a project that will take longer to complete. Those risks may be pedagogical — designing a new course that pushes you and your students in productive ways, but that may also take time away from your research. Those risks may be institutional — say, publishing with a popular press instead of a refereed / academic press (academe values the latter more than the former). Or seeking to reform the tenure system within your university. Or writing a piece for the Chronicle in which you imply dissatisfaction with the “godforsaken place” where you teach. (Professor Blanchard writes, “there are less-savory synonyms for the pleasant-sounding euphemism of ‘job security,’ such as ‘stuck’ or ‘trapped’ or ‘you’ll never get out of this godforsaken place!’”) Tenure grants you a degree of intellectual and professional freedom. So, to any others who experience post-tenure depression: the cause seems (to this armchair psychologist) not to be tenure, but rather the elevation of tenure to Supreme Academic Achievement. Tenure is a major achievement, to be sure. But it’s only one stop along the way to … wherever your work leads you. For those of us fortunate to have tenure-track jobs, scholarship should be a journey, not a destination. 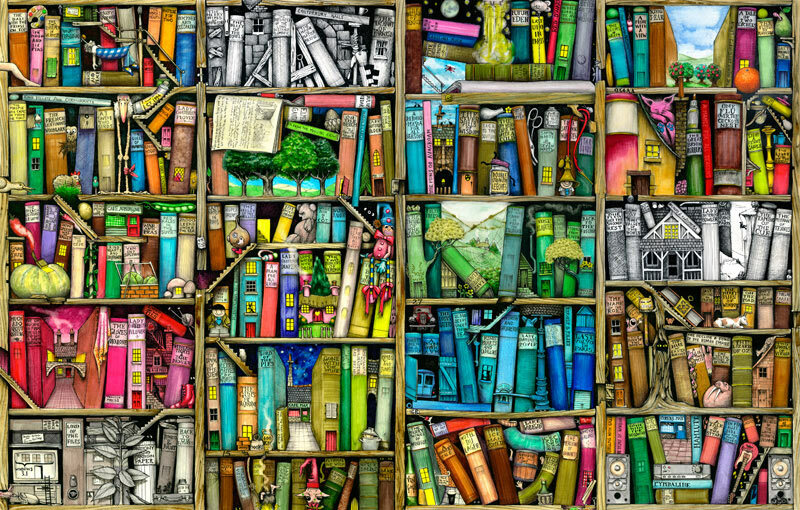 Image source: Colin Thompson, “Bookshelf.” Available via Gelaskins. While I don’t agree with Dr. Blanchard, her article–along with this response–does make me think about perception: I don’t pretend to know or even marginally understand the intricacies of academic politics, but I would wager that how Dr. Blanchard perceives tenure and the way I (and perhaps thousands of current graduate students in the Humanities) perceive are very different. Tenure, from what I understand of it, is meant to protect professors and their research–for a university to defend and support a professor who has established him or herself and potentially controversial projects. It provides, as Dr. Nel points out, “an opportunity to explore newer, perhaps riskier, academic endeavors.” And while this may be all well and good, it also assumes that universities still value knowledge for the sake of knowledge, which I have found to be an optimistic view of the Humanities–especially at large research universities. While tenure continues to provide all of those intellectual opportunities, it is still an idealistic (perhaps even romanticized) view of tenure and the current academic climate. At least for me, tenure IS the point–but not for Dr. Blanchard’s white-whine reasons: tenure is job security. It is ultimately the only thing that guarantees anyone in academia their jobs. It’s a frightening and grueling process (that I can’t even speak to; at least not yet) for everyone involved regardless of generation, but I suspect those of us going into it now regard it differently from those who have already achieved it: it firstly serves a utilitarian purpose to promise us our jobs, and secondly an attractive purpose to further the work we do. Orlando: Yep. Or, another way to put this is that tenure enables you (if you choose) to pursue knowledge for its own sake — an ideal that, as you correctly note, is no longer valued to the degree that it once was (to put it mildly!). But it doesn’t have to be pursuit of knowledge for its own sake, of course. The larger point is that one of course should keep an eye on the tenure “prize,” but never lose sight of the larger picture, the bigger questions that animate your research. My grandparents used to read Donald Crews’ We Read: A to Z to us when we were kids. I remembered the “A to Z” part but not the rest of the title or the author. I was so excited when I googled it and came across the image of the book on your blog! Firstly, thanks for helping me to identify the book. It is also cool to read some context about it. I remember being fascinated – as intellectually stimulated as a toddler can be – by this unique book. In retrospect,I guess it was my first exposure to modern art. Thanks again! Esther: Thank you. Glad the blog has proven helpful. I think, though, that you might have intended to post this comment under the post Emily’s Library, Part 4: Ten Alphabet Books. I meant to comment on a page called “That’s Not in the Book, You Know…” and I’m not quite sure how my comment wound up here. Anyway, thanks again!